INFO: A friend showed me a picture of a fun mohawk haircut similar to this and asked if I could design a hat. I LOVE how it turned out and hope you will too! SKILL LEVEL: Beginner with understanding of basic crochet skills. MATERIALS: I hook, worsted weight yarn. 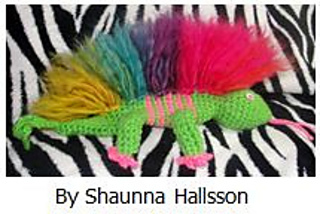 Mohawk, as shown, is made from 100% wool yarn, but acrylic could be substituted for a slightly different appearance. INCLUDED: Instructions for making beanie with ear flaps, stuffie (separate or on hat), detailed mohawk how-to. The mohawk is EASY and quick to make, plus it stays up. My son, the model in the photos, ran around before photos were taken and the hat was not adjusted. Looks GREAT! it is made from 100% wool (Wisdom Yarns Poems Chunky in Reverie) BUT is fun made from acrylic yarn too.